The Red Sox kicked off the second round of interleague play last weekend, hosting the Brewers for a three-game set. Working my usual Sunday shift for the Herald, I picked up a day game to round out the series. It was a pretty basic game, not a whole lot of drama, especially after the Sox went up big in the first inning with some long balls and wall balls off the Green Monster. Everyone tends to go into cruise control when the lead approaches double digits… The Sox went on to win, 12-3, with the infield looking a lot like a track meet with all the white jerseys rounding the bases. 6/19/2011 -- BOSTON -- Red Sox starting pitcher Tim Wakefield pitches to Brewers second baseman Rickie Weeks in the first inning at Fenway Park on June 19, 2011. 6/19/2011 -- BOSTON -- Red Sox first baseman Adrian Gonzalez hits a chopper down the line, reaching on an error in the first inning, against the Brewers at Fenway Park on June 19, 2011. 6/19/2011 -- BOSTON -- Red Sox center fielder Jacoby Ellsbury is greeted at home by designated hitter David Ortiz after scoring against the Brewers at Fenway Park on June 19, 2011. 6/19/2011 -- BOSTON -- Red Sox third baseman Kevin Youkilis tracks the path of this 3-run home run in the first inning against the Brewers at Fenway Park on June 19, 2011. 6/19/2011 -- BOSTON -- Red Sox second baseman Dustin Pedroia rounds the bases after hitting a solo home run against the Brewers starting pitcher Yovani Gallardo, right, in the fourth inning at Fenway Park on June 19, 2011. 6/19/2011 -- BOSTON -- Red Sox first baseman Adrian Gonzalez slides into third on a triple — his 1000th career hit — ahead of the play to Brewers third baseman Casey McGehee against the Brewers in the fourth inning at Fenway Park on June 19, 2011. 6/19/2011 -- BOSTON -- Red Sox left field Josh Reddick reacts after striking out against the Brewers Fenway Park on June 19, 2011. 6/19/2011 -- BOSTON -- Red Sox second baseman Dustin Pedroia looks around after sliding into second after reaching an error in right field against the Brewers Fenway Park on June 19, 2011. 6/19/2011 -- BOSTON -- Brewers reliever Mark DeFelice fields a dribbler against Red Sox first baseman Kevin Youkilis at Fenway Park on June 19, 2011. 6/19/2011 -- BOSTON -- Red Sox left fielder Josh Reddick dodges shortstop Marco Scutaro while fielding a fly ball against the Brewers Fenway Park on June 19, 2011. Talk about unintended consequences for an ad campaign… Last week, Mayor Thomas Menino had a beef with the Nike Town store on Newbury Street in Boston, taking issue with their use of suggestive t-shirts to imply drug use. The store eventually took down most of the shirts, but left one shirt up as of Sunday. The Herald sent me to follow up with some photos, which put me in a great spot to see “The Old School Dropouts,” who coincidentally set up in a prime location in front of the t-shirt display. You don’t have to put two-and-two together to know that I was pretty much salivating at the opportunity to play! 6/26/2011 -- BOSTON -- Cyrus Brooks, 23, of Mattapan, flips fellow "Old School Dropouts" dance troupe member Freddy Suero, 24, outside the NikeTown store on Newbury Street as Brooks' dance student, Aidan Dunbar, 17, of Cambridge, right, watches, on June 26, 2011. The store only has one remaining "Dope" t-shirt on display after Mayor Thomas Menino took issue with the company's latest ad campaign. 6/26/2011 -- BOSTON -- Cyrus Brooks, 23, of Mattapan, does an arm balance as his dance student Aidan Dunbar, 17, Cambridge, watches outside the NikeTown store on Newbury Street on June 26, 2011. The NikeTown store had one remaining "Dope" t-shirt on display after Mayor Thomas Menino took issue with the company's latest ad campaign. 6/26/2011 -- BOSTON -- The NikeTown store on Newbury Street had one remaining "Dope" shirt on display on June 26, 2011, a week after Mayor Thomas Menino took issue with the company's latest ad campaign. 6/26/2011 -- BOSTON -- Freddy Suero, 24, of the "Old School Dropouts" dance troupe does a front flip over audience members and fellow dancer Cyrus Brooks, 24, right, outside the NikeTown store on Newbury Street as Brooks' dance student, Aidan Dunbar, 17, of Cambridge, far right, watches, on June 26, 2011. The store only has one remaining "Dope" t-shirt on display after Mayor Thomas Menino took issue with the company's latest ad campaign. As many people were chanting a few weeks ago in Boston, “We got the Cup!” So as part of the 100-day celebration with the Stanley Cup, the Bruins made a quick stop at Fenway Park to show off their new hardware with the Red Sox and their fans. 6/19/2011 -- BOSTON -- Bruins captain Zdeno Chara hoists the Stanley Cup during a pregame ceremony before the Red Sox faced the Brewers Fenway Park on June 19, 2011. 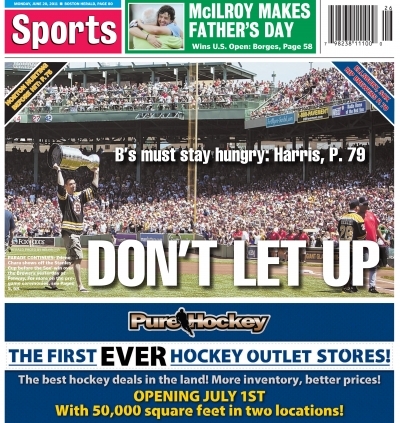 6/19/2011 -- BOSTON -- The Bruins throw out the ceremonial first pitches before the Red Sox faced the Brewers at Fenway Park on June 19, 2011.